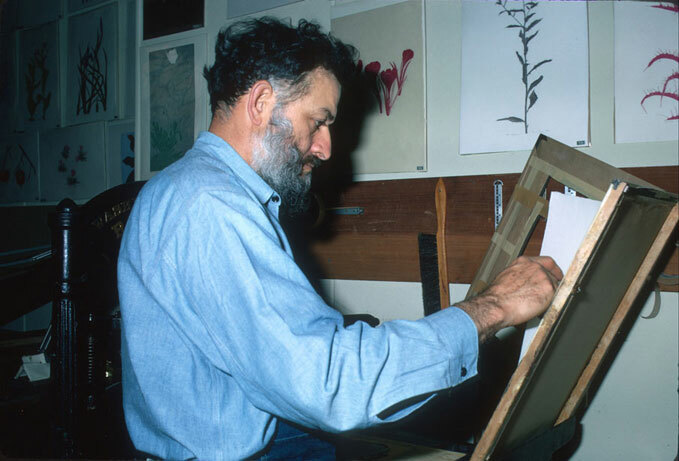 Henry Evans (1918–1990) began making botanical prints in 1958, depicting some 1400 subjects in 31 years. In that time, he was accorded more than 250 one-man shows in many countries around the world and, almost every state in the union. Admired by art lovers and naturalists alike, Henry’s work reveals a style intriguingly personal and botanically faithful, unerring in its feeling for rhythm and design. Self-taught as a printer, botanist, and artist, he developed a unique style and technique. He drew directly from living subjects, and all subjects were portrayed life-size. 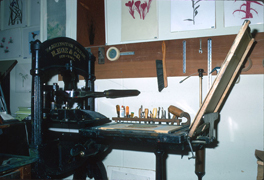 He used linoleum as a printing surface and an 1852 Washington Hand Press to make the prints. All of the work was done by hand. All of the materials that were used were of the best quality, and all of the editions were limited. 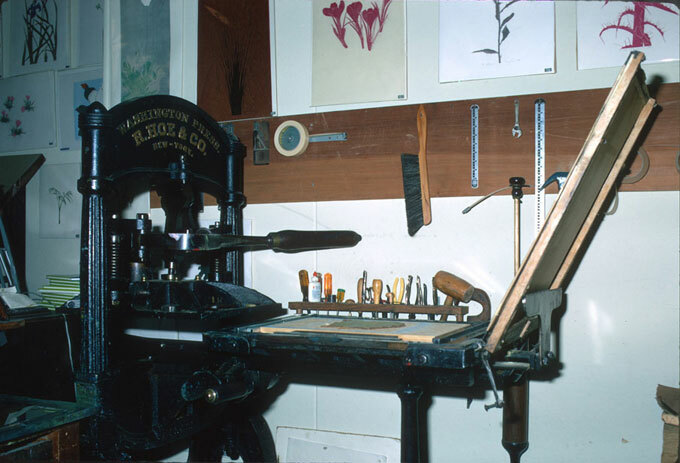 Each linoleum-block print was numbered, dated, and signed by the artist. After printing, the blocks were destroyed. Henry Evans’s linocuts are found in the great print collections of the Albertina in Vienna, the Library of Congress in Washington, and the New York Public Library; in various museums and libraries across the country; and in numerous private collections in America and abroad. 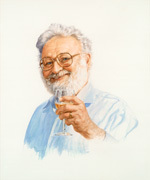 Henry Evans wrote and illustrated books and magazine articles, talked before groups both here and abroad on printmaking (including a stint of lectures for the State Department in Europe and the Middle East), and, along with his wife, Marsha, met the public in their galleries in the Napa Valley and San Francisco. From 1974, Marsha worked on shows and gallery arrangements and did most of the presswork on the prints. Henry selected the subjects, made the drawings, cut the blocks, and mixed the colors. It was, in the best sense, a husband-and-wife team. 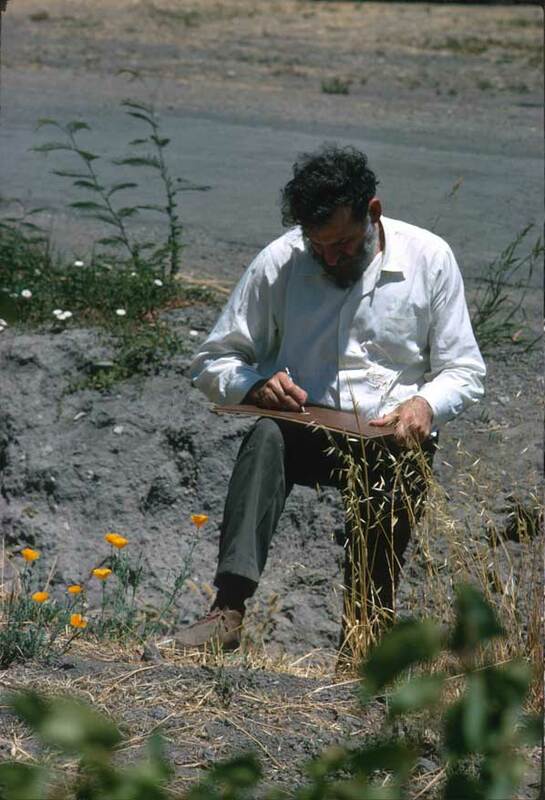 Among numerous publications, the artist’s most important books and portfolios include The State Flowers of the United States (1972); Botanical Prints: With Excerpts from the Artist’s Notebooks (1977); and California Native Wildflowers (1985). 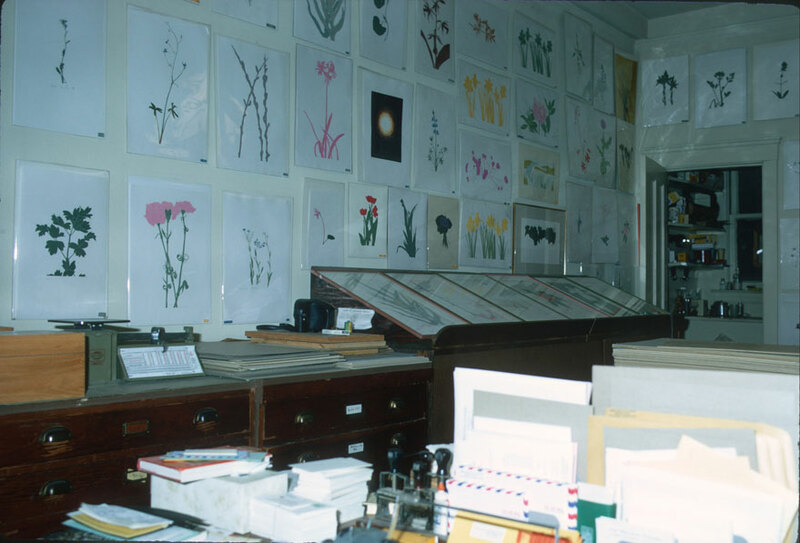 Some of the more notable exhibitions of Henry Evans’s prints have been held at the Hunt Institute for Botanical Documentation in Pittsburgh, the National Arboretum in Washington, Northwestern University at Evanston, The Royal Horticultural Society in London, the Field Museum in Chicago, the Smithsonian Institution in Washington, McGill University in Montreal, the Missouri Botanical Garden in St. Louis, the California Academy of Sciences in San Francisco, and the Los Angeles County Museum.